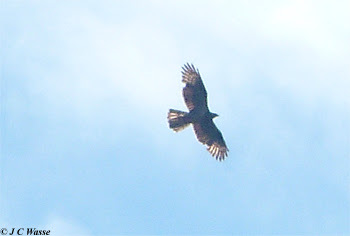 Jonathan's Birding Blog: Get on this 'Buzzard', it's barred! Get on this 'Buzzard', it's barred! Back home for the weekend and first birding stop was at the couple of weirs along the river Don east of Sheffield city centre (Sat 04 Aug 2018). A scattering of Lesser Black-backed and Black-headed Gulls with a lone Common Gull. 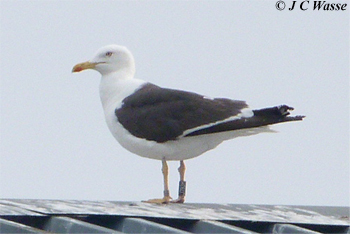 An adult Lesser Black-backed Gull originating from Stavanger, Norway with black colour ring J793H showed briefly. It was ringed in 2015 its first calendar year - with thanks to Andy D for the information. Assuming intermedius. Several sightings of Kingfisher point to a healthy urban river and a Sand Martin showed well hawking insects. 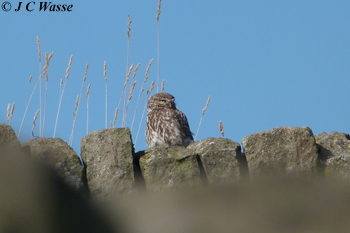 Over the weekend the moorland edge provided good and varied birding as did the approach just outside of the Peak District where a Little Owl watched horse riders go by from its stone wall lookout, pausing before it hunted the edge of a newly cut field. Several Curlews remained in the uplands as the breeding season draws to a close, yet Ravens were reinforcing pair bonding as two put on a bit of a tumble over a moorland valley. Hide your sausage rolls from this troublemaker, the one on the left, it even ran around the building to make a 3rd attempt on the food bag! As dusk fell Venus and Jupiter began to shine bright in the western sky to the backdrop of a couple of churring Nightjars. Just after 10pm as Jupiter fell, Saturn and a bright red Mars showed well in the western sky. 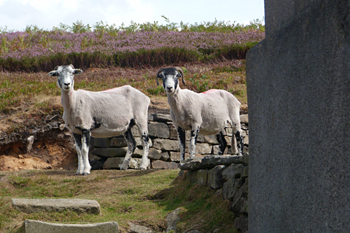 Birding the South Yorkshire moorland edge is always magical and this weekend proved no exception. Whilst it was very early on in the autumn migration season this stretch is always worth a look. Arrived at Low Moor, Midhope at about 10 am (Sun 05 Aug 2018) and it was starting to get warm as high pressure remained dominant, although a light SW wind did help temper the heat. The fair weather marker clouds were beginning to melt into the blue background. Looking back towards Upper Midhope where the previous afternoon a Hobby had startled the hirundines, with thanks to the alarm calling Swallows who got us on to the scythe shaped predator, I was scanning this area for a repeat performance. 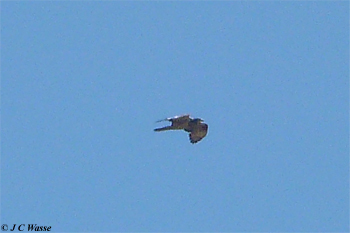 Not to be, but a Common Buzzard drifted over fairly low down and another came into view but at a greater height. 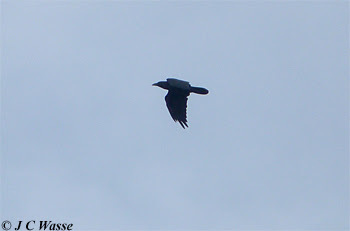 It launched into a power glide and soon they both headed towards Midhope Reservoir which they circled. Were they local or birds on the move using the light headwind to inform their route? A 360 degrees scan during the first hour also revealed several Buzzards to the south west along the moorland ridge and plentiful Kestrels hovered over both the moorland and grassy fields. A couple of the young Kestrels squabbled by the track much to the annoyance of a pair of Jays. Just after 11 am my dad spotted a couple more Common Buzzards drifting in from the direction of Langsett Reservoir, along the same line as the ones mentioned above. Checking the status of wing moult is a good pointer to help identify if the same birds are being seen again and again, will help in ageing the birds, but sadly missing feathers may be for another not so good reason. 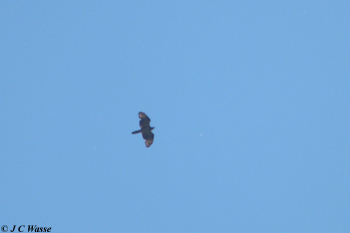 A third 'Buzzard' appeared, a new bird because it was clearly missing a few feathers (at the join of the primaries and secondaries) in the same place on each wing. I scoped it and alarm bells started to ring, I'm glad to say not because of the state of the bird, because of what species it was. It had barring / thick spots on the underparts against a pale body with barring extending into the front of the underwing. Head appeared grey-ish, not totally hooded as it had a white throat. We watched it pass overhead and I took a few record photos as it glided towards Ewden Heights. Throughout the observation it never flapped and maintained at least flat wings, no dihedral discernible. 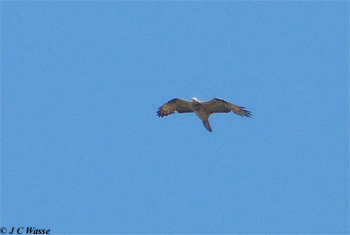 We were confident that it was a Honey Buzzard, but could we track it down the Langsett - Strines valley? Off to Ewden Heights. Within a few minutes we were set up half way down the valley just below the Heights waiting in hope for it to appear from the Heights, and luckily enough a couple of minutes later it did. Camera and scope at the ready, and after having nice scope views of the flight profile, its slender long tail and at the other end its grey protruding head, not to forget striking barred underparts and with more record shots taken, it made a beeline for Broomhead Reservoir. Likewise we made a run for it to Agden Side trying to alert as many birders as possible in situ and along the road. We were soon at Agden Side and with other birders present we concentrated on White Lee plantation hoping it would choose this route as its way south. A bit of a gamble but sure enough just after 1130 it appeared from the direction of Broomhead Reservoir and all present had nice views as it slowly crossed over the Rocher and was last seen heading towards Sheffield city centre. It didn't flap once! 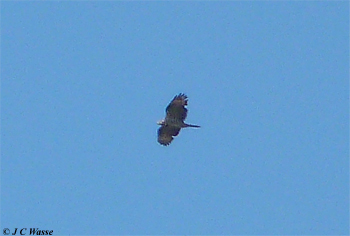 Assessing the photos showed it to be a moulting Honey Buzzard, and at the moment I reckon it was a male. It was a very nice surprise, a brilliant Barnsley tick (#231) and a new one for my moorland raptor list. 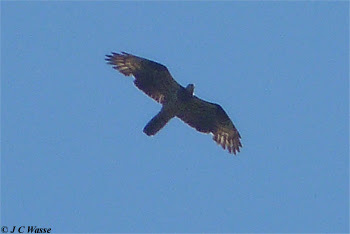 Come on Pallid Harrier, you're next on the wish list for the patch, but stay safe when in the area!